The first touchpoint was a re-creation of the famous red tunnel at Old Trafford. Soccer aficionados are some of the most passionate fans on the globe. But despite the undying loyalty they hold for their teams, very few of them get to experience the sights and sounds of the actual stadiums. That’s where Uber saw an opportunity to deliver fans and people closer to their passions. 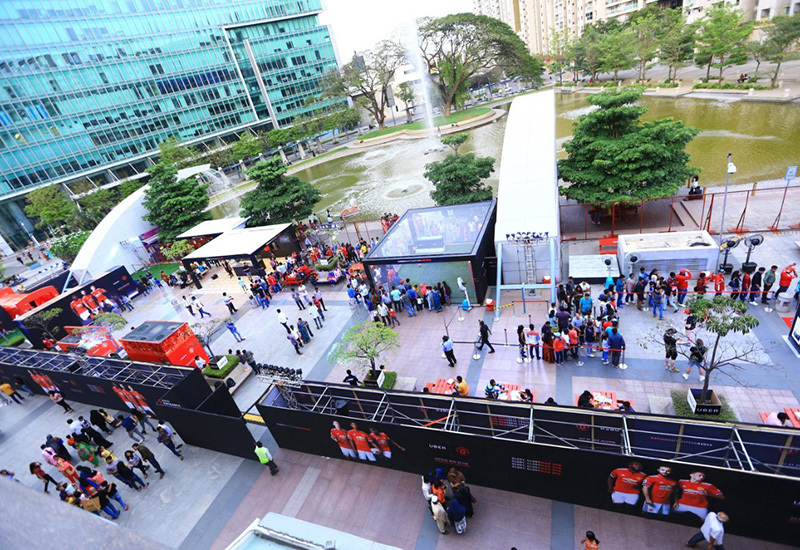 As the official ride-sharing partner of the team Manchester United, the brand built an immersive fan experience April 27-29 in Bengaluru, India, modeled after Old Trafford, Manchester United’s (or Man Utd’s) storied home stadium. The solution was to go to great lengths to replicate that experience for those who’ll never make the trip to England. But finding the right location was key. After some extensive sourcing and scouting, the team chose Bengaluru’s Orion Mall, which enjoyed a high level of foot traffic, had an open walkway in front of its main entrance suitable for building out an experience, and was situated right next to a major metro station. Uber India used social media outreach to get the word out about the experience, which helped drive people to a registration page and allow attendees to use QR codes on-site for an expedited check-in. 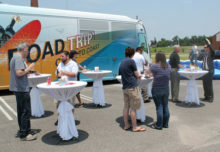 But the activation was open to passersby as well. Given the popularity of the team in India, many attendees went all out with their garb. They came in jerseys and wore face paint. Local Man Utd supporter clubs, invited by Uber, arrived in groups and sang popular Man Utd chants you’d hear in the stadium—an added bonus for the brand, as songs are an integral part of the authentic match day experience. Uber didn’t leave it all up to the local clubs to create an atmosphere, of course. 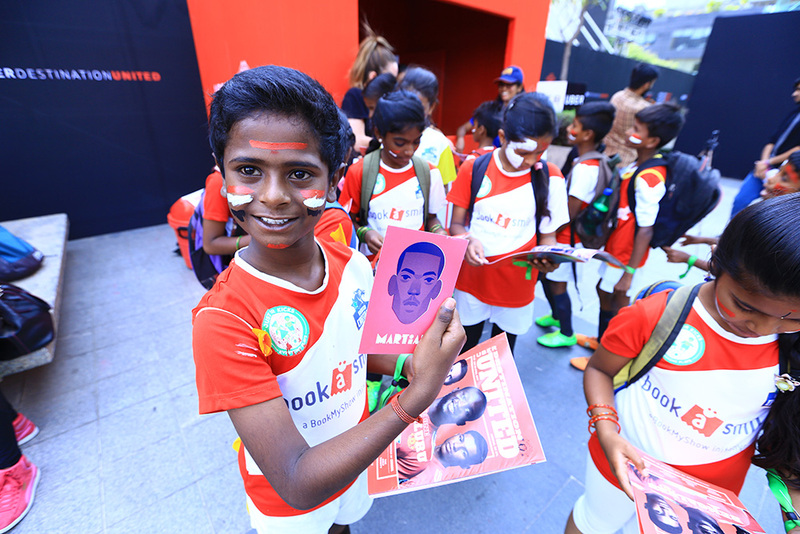 The activation was full of match day moments. 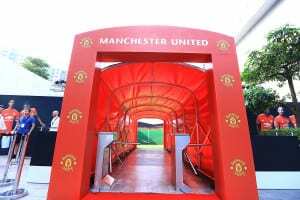 The first touchpoint was a re-creation of the famous red tunnel at Old Trafford, through which players walk onto the pitch from the locker room ahead of the game. Fans themselves would walk through it and onto a turf area that featured a wall covered in a giant, high-res photo of the Man Utd pitch—a natural spot to pose for pic with hashtag #UberDestinationUnited, facilitated by staffers on-site. Next came an immersive match day soundscape—the cheers, the chants, the player intros—that emanated throughout the outdoor venue space. The event included multiple Q&As with Man Utd legend Wes Brown. There was also an Uber Destination United museum, which housed historical Man Utd memorabilia, including David Beckham’s boots, a Roy Keane jersey and a League Cup winners medal, all curated by Jason Leach, the team’s own museum curator based in Manchester. At several points during the three days Leach hosted Q&As in the space with Man Utd legend Wes Brown, a former player who currently plays in India. Food stalls with match day snacks like chicken dogs and veggie burgers were served from Man-Utd-red kiosks and an exclusive fanzine was distributed and used to capture autographs from Wes Brown. 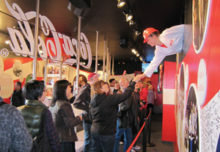 Consumers could test out their soccer skills in a challenge to win jerseys, hats and Manchester United soccer balls. A replica of the locker room at Old Trafford was created, a virtual reality tour of the stadium was on hand, and an augmented reality app allowed attendees to take pics with the United Trinity—a statue of legendary players George Best, Denis Law and Sir Bobby Charlton that’s located outside of Old Trafford. And at the close of the experience was an immersive, 360-degree video projection inside a dome viewed by 35 attendees at a time. The six-minute segment, created by Copa90, featured highlights from games, but it also depicted an Uber drive to the stadium, the walk up to it and even taking a seat in the stands. At the end of the activation’s third day was the grand finale: Uber invited 35 guests to watch the Manchester United versus Arsenal game inside the dome—live, seated on a turf field, next to Wes Brown. Agency: Manifold, San Francisco. Orion Mall was chosen as the activation site thanks to ample foot traffic, an open walkway and proximity to a major metro station.